Perhaps this blog entry should begin with a disclaimer. Since first viewing the film Wake in Fright in the 1970s, I have never, ever wanted to visit the outback. And as for the 2005 film Wolf Creek, well, I never, ever, even considered watching it. So with this in mind, I didn’t immediately jump at the chance of going to the outback when a close friend asked me to accompany her on a flying visit to see her daughter in Broome in outback Western Australia recently. She was keen for some company, because her husband couldn’t go due to work commitments, her son had Year 12 tests, another daughter was too busy with horse-eventing practice and her six other best friends begged off for very valid reasons. I had unexpectedly, and shockingly, reached the top of her list. And let’s be honest, I have a blog to feed. If visiting the outback on a whim turns out not to be fun, surely it can be considered frivolous? There’s no doubt that the outback is another country. The heat, the dust, the colours. 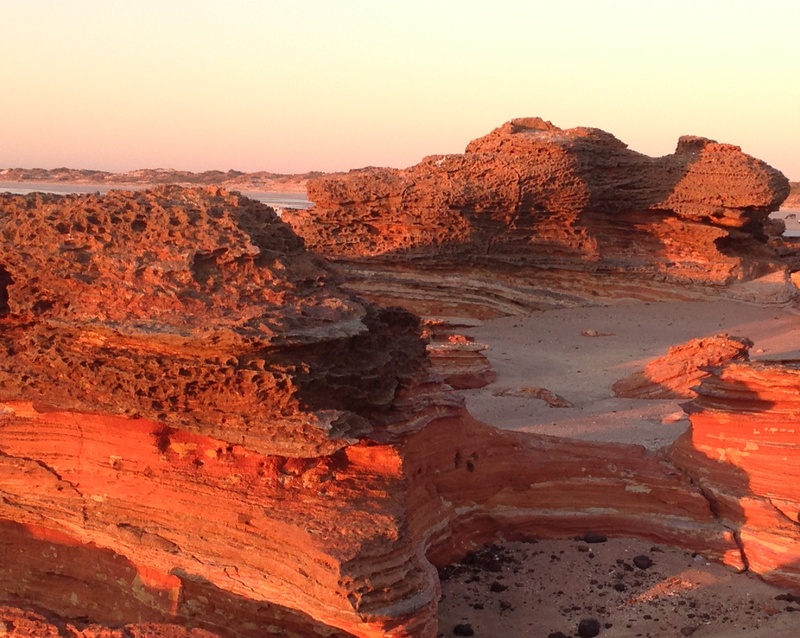 Especially the colours with the rich, red soil and startling rocks like nothing you see in the south. While I didn’t manage to view the dinosaur footprints during my short stay, or even catch the moon and staircase rising over the ocean, I did watch a beautiful sunset at Gantheaume Point. But wait, there’s more. My friend’s daughter was competing in the barrel racing section at the Broome Rodeo! Yes, fun and frivolous activity #20 Have an Outback Experience was now expanding to include ‘And attend an Outback Rodeo’. And for those of you who don’t know what barrel-racing is (I certainly didn’t) it’s where the cowgirls at a rodeo are permitted to enter the arena for a few brief moments to ride their horses tightly around three strategically placed barrels in a clover-leafed pattern to display their speed and horsemanship. But the real point of a rodeo, of course, is to see the cowboys wrangle cattle and stay as long as possible on the back of a bucking bull or horse. And here’s the scary outback twist to the story. The bull or horse only bucks because it has a strap pulled tightly around its most sensitive bits before being sent out with the cowboy on its back. But I’m delighted to report that the animal always wins. Any chap able to stay more than ten seconds on the beast’s back is cheered wildly, but he still ends up on the ground. One unfortunate fellow was bucked off his ride a millisecond after galloping into the arena, so was generously given a second chance. But as if the first ride wasn’t embarrassing enough in this heart of tough-guy territory, he promptly fell off the second time even faster. Hilarious! As we flew back from Broome to Melbourne, the pilot told us we’d be passing directly over Ayers Rock and as the weather was clear, we’d all get a great look at it. Five minutes later, he was back on the microphone, apologising. Sure enough, in another five minutes, we were passing over Uluru and I had a spectacular view from above as the apologetic pilot dipped the plane’s right wing for a full 30 seconds. So now I’ve seen the outback, been to a rodeo, watched a sunset on Cable beach, seen a boab tree and inspected Uluru from the sky. And I’ll never, ever have to do it again. 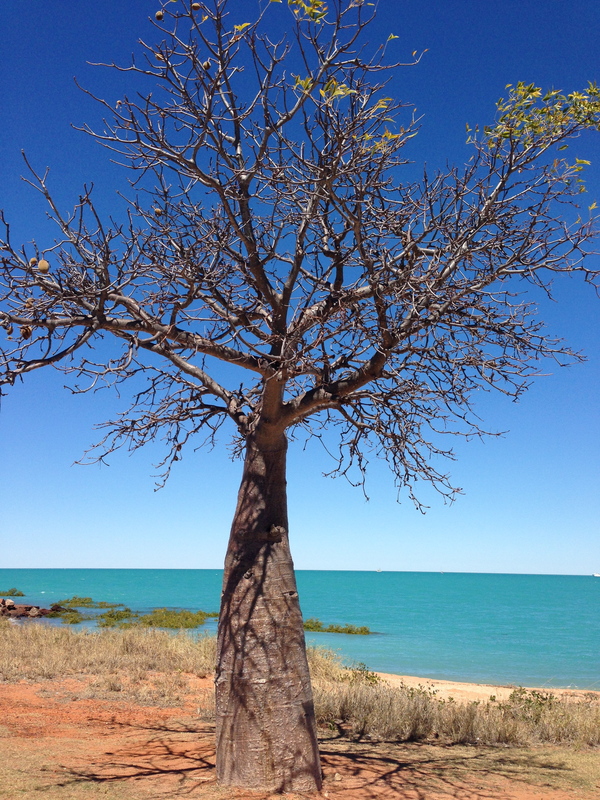 Pretty as a … boab tree. This entry was posted in Family, Friends and Home, Travel, Try Something Different and tagged Barrel Racing, Boab Tree, Broome, Flying over Uluru, Outback experience, Rodeo, Wake in Fright, Wolf Creek on August 20, 2014 by outsidethesquare101.